Click on the picture or the video below to hear Ward's story. Respond to the questions on the handout and return to the Oral History page. World War II Veteran Harold recounts his service aboard the USS San Francisco. Mr. Ward was an eyewitness to the attack on Pearl Harbor as well as serving aboard the USS San Francisco during the Guadalcanal Campaign. 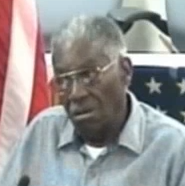 In this clip Mr. Ward also tells the viewer of the harsh treatment he and other African-American servicemen experienced while serving in the defense of their country during World War II.